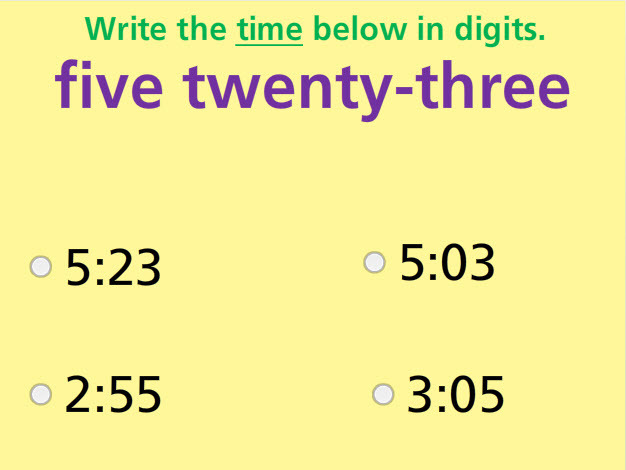 Write time in digits to show your progress in this interactive math test. This test gives immediate feedback for diagnosis and reinforcement. This test gives time in word form for conversion to digital form. There are seven multiple-choice questions and three drag-and-drop questions. Students will have to know half past, quarter past, quarter to, and ten to. These are but a few of the activities that the students will face in this interactive assessment. Return from this Write Time in Digits Math Test to the Elementary Math Tests , 3rd Grade Math Tests webpage, or to Math Tests.